Radley Stephen, Country Head (Sri Lanka) and Regional Head, Business Development and Communication CIMA, presented cricket kits to A Weerasooriya, the acting principal of Kingswood College, Kandy. Sunil Herath, Master in Charge of Cricket, Kasun Bandara, the Captain of the cricket team and Surangani Rupasinghe, Student Service Executive of CIMA, were also present at the ceremony. Radley Stephen, Country Head (Sri Lanka) and Regional Head. 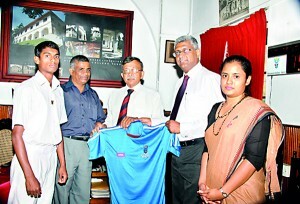 Business Development and Communication CIMA, presenting cricket kits to S. M. Keerthirathne, Principal of Dharmaraja College, Kandy. Sarath Abeygunasekara; the POG, Sarath Ekanayake, Master in Charge of Cricket, and Surangani Rupasinghe, Student Service Executive of CIMA, were also present at the ceremony.